The focus of my blog is to review book series and not individual novels, but writers are going to continue writing novels within a series even after I have done my review, so I plan on reviewing the individual novels as they come into circulation. Bette Golden Lamb and JJ Lamb have just recently added book #4, Bone of Contention, to the Gina Mazzio series. Gina Mazzio, nurse extraordinaire, is back in the lasted installment by indie authors Bette Golden Lamb and her coauthor and husband, JJ Lamb. Mazzio is a nurse at Ridgewood Hospital in San Francisco, California and has a knack of getting herself in trouble, meaning that she has a way of attracting sociopathic killers. In Bone of Contention, Mazzio has a lot on her plate, with a vengeful ex-husband seeking payback for sending him to jail, overly zealous Pro-lifers seeking lethal justice and if that wasn’t enough, her baby brother Vinnie, recently discharged from the military with PTSD, is visiting. There is no mystery in Bone of Contention as the bad guys are known right from the start but the fun is observing how Mazzio figures it out and then more importantly how she eventually nabs the bad guys. Even though Mazzio is a warrior in scrubs, she is not alone in her quest for justice. She has her fiancé, Harry Lucke, faithfully at her side along with her bother Vinnie and Inspector Mulzini from the San Francisco police department. 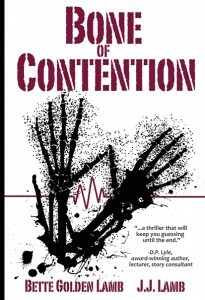 There is no question that Bone of Contention is a fun medical thriller to spend a lazy weekend reading. The Lambs, however, are not satisfied in just entertaining us thrill seekers, but they are also tackling the very sensitive subjects of abortion, cyber-bullying and PTSD. Three women are being portrayed in the story as facing the highly emotional issue of an unexpected pregnancy and the difficult decision between having the child versus having an abortion. These women do not make their decision lightly, and face guilt, persecution, and even death once they make their decision to pursue the abortion. Women in desperate situations will pursue desperate means to solve their problems and the Lambs give an example of this with a back-alley abortion gone very badly which in reality may be an unfortunate consequence if Roe vs. Wade is reversed. I read my version of this novel on my Kindle and there are some formatting issues (lack of separation between paragraphs, and gaps within words). At first they were annoying but don’t give up eventually you get used to it. I would like to wrap up my review by thanking our unsung heroines in white and their dedication to the care of the sick and injured. I think that the latest matters relating to the threat of Ebola only reflects their selflessness and bravery as the battle goes on to stop this epidemic. I would also like to wish a speedy recovery for nurses, Nina Pham and Amber Vinson from their bout with this nasty virus. To learn more about the series check out Bette Golden Lamb and JJ Lamb’s Gina Mazzio Series. Posted in Medical Thriller.Tagged Bette Golden Lamb, Bone of Contention, Book Review, Book Review Blog, Book Series, Gina Mazzio, Indie, JJ Lamb, Medical Thriller, Thriller.